The history of flute dates back to thousands of years ago when people used it for communication purpose. Even today in the 21st century, flute or popularly referred as the ‘Indian Bansuri’ has not lost its charm and people continue to enjoy the sweet melody of the flute. The Bansuri is considered as the first wind instrument used by man. Playing of the flute has been an important part of the Indian Classical music since many years. Bansuri in India has been played by many talented musicians since decades in the country. Bansuri is made from bamboo, a special kind of bamboo grown in the southern and north eastern areas of India. The section between the nodes are sufficiently long areas in between the nodes. The popular bansuri of India has been a special musical instrument of Lord Krishna which has been a source of healing for many. Beautiful melody of sounds created with the bansuri takes you to land unexplored. The rythmic melody of the bansuri opens us to the beautiful sounds of nature, like the birds, and flowing water. We might be living in the digital age today, but the beautiful sound produced by the flute cannot be replaced by any digital device. The sweet music produced on playing the bansuri creates soothing effect on the mind. Music always captivates the interest of people and has done so since ages and is also a great way to feel de – stressed. Playing the bansuri is definitely enjoyed by the flautists as well as the audience who loves to hear to this musical melody. Apart from the simple joy it offers, it also provides many significant health benefits. Playing the bansuri has been linked with improvement and enhancement of spiritual awareness. Playing it helps to improve the energy flow through the body and leads to spiritual awakening of the soul. Overall it offers positive effect on your body. Playing the bansuri has been linked to meditation. The regular breath movements done while playing the instrument is similar to that of pranayam breathing movements. Hence, bansuri playing has been linked to meditation as well. Playing a musical instrument of any kind enhances and improves the coordination of a person. This is one of the main reasons why flautists have great coordination skills. Their hand coordination and eye coordination movements are improved significantly over a period of time. Thousands of people suffer from the health problem of depression. The sound of the beautiful music, either through tabla, flute, or piano provides soothing effect on the mind which in turn relieves you of the tensions and worries of the everyday work and hassles. The gentle music of the bansuri helps in removal of emotional blockages and reduce tensions. It improves the breathing movements. Since blowing air through the bansuri needs efficient and effective air movements, the breathing capacity improves of the player. Secondly the flute blows air vibrations which are produced by the flautists improving the respiratory system. Playing bansuri regularly reduces the risk of bronchitis. Playing this instrument is also linked to enhanced concentration. Since a flautist is mostly associated with a musical group and has to play along with many other players, this requires proper concentration. So over a period of time, concentration of the flautist improves as presence in a musical group requires high level of concentration to match the rhythm, and beats of the other players. Flute for meditation is also practiced by many. No matter wherever bansuri is played in the world, it is a means of connecting with the people by form of conveying emotions, love, and feelings. No doubt, bansuri was Lord Krishna’s magic instrument and all the Gopies went in a trans on hearing its sweet melody. It has been shown that listening as well as playing music has a positive effect on your memory power. Hence flautists and other musicians have higher memory power. Playing the popular Indian Bansuri helps in the improvement of the lung power. Better than that, regular flute playing gives you the results same as that of Pranayam. 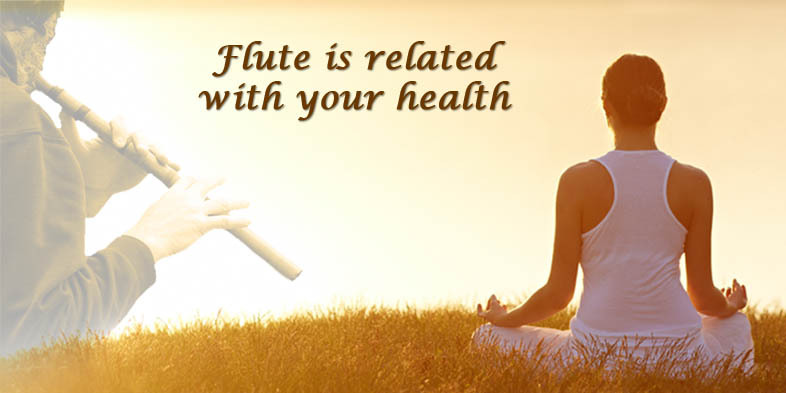 These are just few of the many health benefits offered by playing the flute. Professional flautist play the flute with passion and great skill which creates a different kind of vibration and resonance among the listeners. Flautists have been seen playing bansuri in large musical concerts, sangeet sammelan, and small baithaks where the audience love its sound. Apart from the various health benefits it offers, it has been linked to offer calmness and solace to the audience and is considered as the Indian meditation music instrument. Many great flautists in India have become popular and renowned figures with their work getting recognition throughout the nation and internationally. Many flautists have also been a part of the bollywood and hollywood movies offering the service of their flute, loved by the spectators. Apart from having the skill to play flute, professional flautist play it from the heart which creates a recreational tone and sound. Popular flute players in different nations of the world have done brilliant performances making people fall in love with this instrument once again. Great flautists have done rigourous practice over the years to master the art of bansuri playing and become leaders in the world of music. Bansuri has been one of the most enjoyed musical instrument by the people of our nation and will continue to be so.